Did you know trillions of microbes make their homes inside your body? In fact, these microorganisms outnumber our human cells 10 to 1, “colonize” us right from birth, and are so interwoven into our existence that without each other, none of us would survive! Thanks to new sophisticated technology and the cutting-edge research of the Human Microbiome Project, we are just starting to discover what these microbes are up to and how they affect us. And now in Zoo in You: The Human Microbiome, a new 2,000 square foot bilingual traveling exhibit created in partnership between JCVI and the Oregon Museum of Science and Industry (OMSI), and funded by a SEPA grant from the NIH, visitors can now explore this fascinating and complex world inside us that is our microbiome—a dynamic, adaptable, and delicately balanced ecosystem like any other found in nature. The exhibition features 15 interactive, free floating hands on components that are designed to focus on three overarching topic areas to educate and inform visitors on the concept that our bodies are complex ecosystems that we are just starting to understand and explore. Through these exhibit components museum goers will “meet the microbes” to learn about the organisms which live on and inside us from the moment we are born, to understanding the importance of the dynamic and delicately balanced human microbiome in “balanced ecosystems”, and lastly visitors will “explore the microbiome” to learn the importance of scientific research to increase our understanding of human health. There are numerous interactive, hands on activities for visitors. Such activities include “Weather Reports” where guests will have the opportunity to interact with green screen technology to give a weather report on the climate conditions of your nose, gut or skin. They also will be able to build a DNA Puzzle where they race against the clock to assemble a DNA strand and participate in a hand washing contest. Participants can challenge each other in exhibit components such as “Microbes in Balance”, a large touch screen video game to see if they can keep their “health-o-meter” in balance and in “Microbe Mirror” a motion sensing activity where visitors come face to face with their full body reflection and control the changes in their microbiome as they react to everyday occurrences. 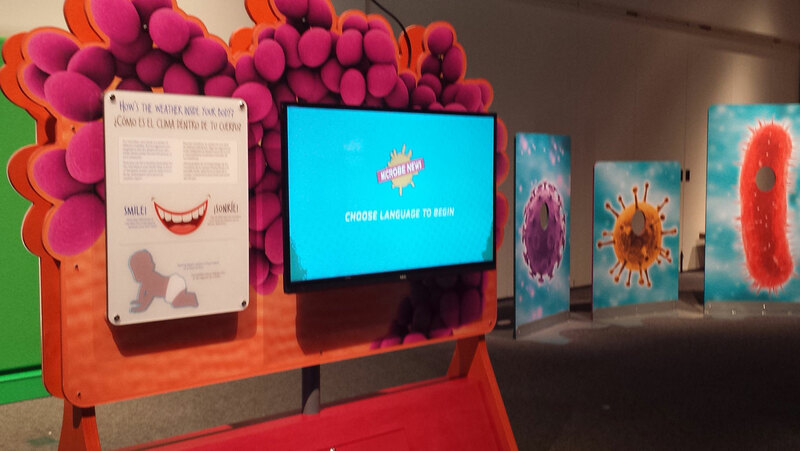 Throughout the exhibit components feature contributions by JCVI Scientists Dr. Karen E. Nelson, Dr. Hernan A. Lorenzi, and Dr. Ramana Madupu including “Stories & Choices” an activity where visitors listen to the scientist interviews and make choices based on various fun questions which relate to microbiome research. The Zoo in You exhibit is now on display at the Oregon Museum of Science and Industry (OMSI) in Portland, OR through July 2015, it will then travel to Science Works Hands-On Museum in Ashland, OR October through December 2015. It will begin its national tour at the Reuben H. Fleet Science Center in San Diego, CA in partnership with JCVI.